30 Day Trial. Ability to save the project is disabled. Please visit http://support.image-line.com/jshop/ for the lastest prices. Added piano roll time markers for labelling and looping purposes. Drop multiple stems or Audio Clips on the Playlist from any Windows file browser. Multi-touch has been extended to Mixer functions, Channel settings and Control Surface. Plugin scanner can now use custom VST search paths. More demos: Raubana - LIFE, Agnivesh ft Avinash - Bahane Bana Kar. Chris Bulman & Sarju Jagai - No Escape. Jose M. Berroa/ Dr. N.D.A - LP700-4 . Nine Loops - Keep it Simple. Image-Line Remote for Android (Google Play) and iOS (iTunes Apps) updated. MiniSynth free synth is included. FL Studio Mobile import updated. Bugfixes as reported since the last version. Multi-touch support - FL Studio and some of its plugins now respond to Multitouch. Debugging code - This version contains code to help us track any bugs deep in the code. Performance Mode - Trigger Clips using your mouse, touch screen, typing keyboard or MIDI controller. Unique controller MIDI input port - Controllers can now be assigned unique input & output ports for feedback. New Content Library - The content library has received a complete overhaul based on user input. Options > Project general settings > Play truncated notes in clips - Restores notes overlapping slice points in Pattern Clips. Horizontal/Vertical movement locking - Shift (horizontal lock) & Ctrl (vertical lock) when moving items. Piano roll click & hold functions - Glue notes, Mouse wheel velocity change, Mouse wheel tool select. Piano roll - Brush tool: Monophonic step mode (hold shift for old behavior). Chop chords: Strum & Articulate tools. Improved Tap Tempo & Fine control - Updated algorithm + nudge control for Performance Mode. Instrument Channels - Ctrl+mouse wheel on Channel button to change the mixer track. Stay open sub-menus - Right click to check several menu items without closing them. Plugin Picker - Start typing plugin names to highlight entries. Right-click data enter - Most controls now allow a Right-click option to type in values. A large number of fixes including a new New FLEngine. Horizontal / vertical zoom & scrolling - Improved Playlist, Piano roll & Event Editor. 32 & 64 Bit VST plugins can be opened in 'Bridged' mode. The maximum memory available to the plugin will be at least 2 Gb for 32 Bit Windows and up to 192 Gb depending on your version of 64 Bit Windows. Audio Clips & Sampler Channels Keep on disk option now opens the sample in a separate memory allocation. Each Audio Clip / Sampler Channel can now load a sample of at least 2 Gb for 32 Bit & 64 Bit Windows versions. Project Picker – Allows preview and selection of Clips in the Playlist & Patterns for improved workflow. Inter-Clip relationships are also displayed. Fruity Edition – Now gains access to Playlist Pattern Clips for unlimited scoring and automation flexibility. Live Playlist marker types - Playlist Time Markers can be set to Loop, Pause or Skip for innovative live performances. Newtone (demo) - is a pitch-correction and time manipulation editor. Slice, correct, edit vocals, instrumentals and other recordings. Pitcher (demo) - is a real-time pitch-correction, manipulation & harmonization plugin that can correct and create 4 voice harmonies under MIDI control from a keyboard or the Piano roll. Patcher (free) – save complete instrument & effect plugin chains as a single preset. ZGameEditor Vizualizer (free) – visualization effect plugin with movie render capability. The free open source ZgameEditor can be used to create visualization create objects for ZGameEditor Visualizer. Never pay for bug-fixes again - Customers who purchase a download edition of FL Studio through Image Line's online shop receive lifetime free downloadable updates. Free updates entitles the customer to all future updates of FL Studio according to level purchased (Express, Fruity, Producer or Signature Bundle). 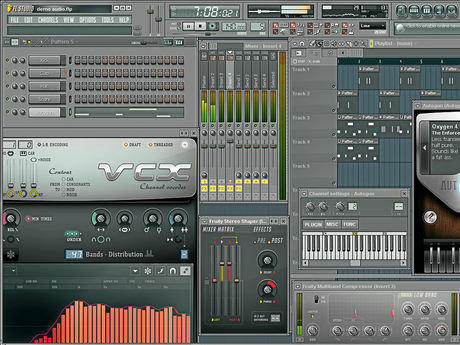 For example, all FL Studio 9 customers will be able to download their version of FL Studio 10, 11, etc., for free. Boxed Edition - Customers who have the Boxed version now also get lifetime free downloadable updates. Posted by KemCam on Tue, 11/13/2012 - 21:42. I will definitely purchase the FL Studio 10.61beta and do a review and put it on my blog. Keep up the good stuff bro! FL Studio 10 coming up! Posted by Fl Studio 10 on Mon, 03/28/2011 - 12:41. Posted by Anonymous on Fri, 10/15/2010 - 16:22.